A public hearing has been scheduled before the Sarasota County Planning Commission on Dec. 15 regarding a proposed Interstate 75 overpass that would connect the future Lakewood Ranch Boulevard with Cattlemen Road, the county has announced. The meeting will be held at 6:30 p.m. in the Commission Chambers of the County Administration Center, located at 1660 Ringling Blvd. in downtown Sarasota. Members of the public are invited to offer comments on the project, which originally was designed to extend to Honore Avenue. County staff has reviewed the comments provided during a recent public meeting on the project, as well as a transportation impact assessment completed by Hanson Engineering, a news release says. As a result, the location of the overpass has been modified slightly, the release adds: The overpass would not directly connect to Honore Avenue. As designed the I-75 overpass “will provide relief of traffic congestion on both University Parkway and Fruitville Road,” the release notes. The addition of the overpass connection to Cattlemen Road in the county’s Future Thoroughfare Plan would allow for pursuit of state and federal funding, as well as eligibility for road mobility fee funding, the release points out. 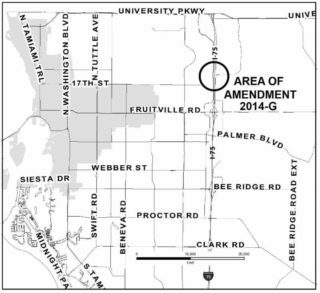 Further, the proposed Comprehensive Plan Amendment at the focus of the Dec. 15 hearing would add to the Future Thoroughfare Plan a minor collector roadway from the future Lakewood Ranch Boulevard to Cattlemen Road, the release notes. Copies of the petition and supporting documents are available during normal business hours in the Planning and Development Services Department at 1660 Ringling Blvd. in Sarasota, the release says. Copies of the materials also will be available to view or download at www.scgov.net; keyword: Planning Commission. Those will be posted on Dec. 9, the release adds. Existing information and material from the recent public workshop may be found online at https://www.scgov.net/PlanningServices/Pages/Workshops.aspx. Among the information is the Hanson Engineering Impact Assessment and I-75 Overpass Project Overview. Members of the public may direct written comments on the proposed amendment to the following address: Planning and Development Services Department, 1660 Ringling Blvd, First Floor, Sarasota FL 34236. Anyone wishing to email comments may send them to planner@scgov.net.